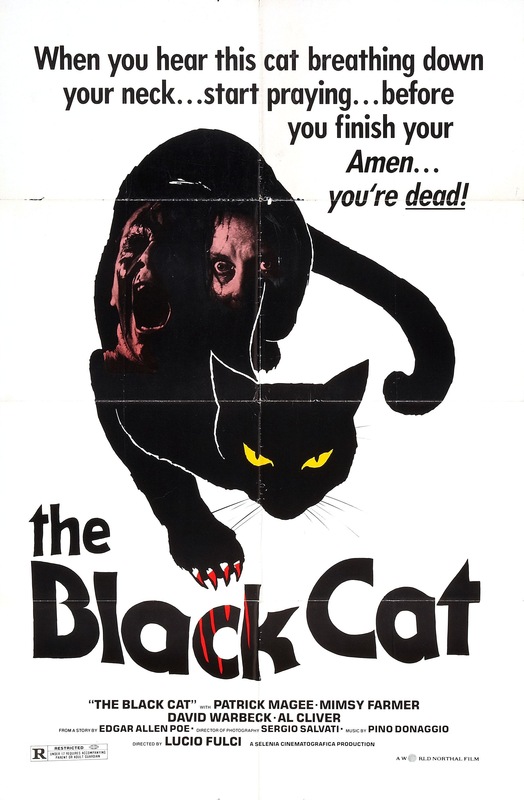 Released in 1981 The Black Cat is one of Fulci’s lesser known films and for those who have seen the film it stands out due to by this point of Fulci’s career he was a splatter director and this film has very little blood. When looking at some of Fulci’s films in the 70s there was some gore, but they weren’t gore films, but most weren’t getting much attention, though have since built up a cult following, but it all changed in 1979 with the release of Zombi 2. As I’ve stated in other reviews of Fulci films Zombi 2 is more than just a splatter movie as it has some great suspense and tension and a great eerie feel. The gore is outstanding and very deserving of the credit it gets, but I do feel people sometimes don’t give the film the respect it deserves. After Zombi 2, Fulci would make a string of gore films starting in 1980 and 1981 with such films as City of the Living Dead, Contraband, The Beyond and House by the Cemetery and after those films came The Black Cat, which was followed up with the New York Ripper another film with grisly gore F/X so seeing as how The Black Cat is mostly bloodless it’s sort of forgotten and those who have seen it aren’t overly fond of it. When I first saw the Black Cat while I can’t say I loved the film I did however find it a decent watch and for the most part I enjoyed it, but revisiting the film it doesn’t really hold up for me and it gets off to a decent start, but as the film goes on it becomes a bit of a chore to sit through. This isn’t Fulci’s worst film, but it is a contender for bottom 5. Many people see Fulci as nothing more than a gore director, which is something I disagree with as Don’t Torture a Duckling, which in my opinion was his best film has very little gore, but for those who think Fulci can only direct an enjoyable film due to the gore F/X the Black Cat will do nothing to change that notion. Even if the Black Cat was the typical Fulci film of its time it wouldn’t make this film anything special since sure when it comes to his splatter flicks the gore F/X were the star and if you remove them I still think the films would be decent due to the eerie atmosphere, but if I’m being totally honest no they wouldn’t be as good, but my point is they have more than just splatter scenes going for them whereas the Black Cat has very little going for it and gore would have helped, but it would still be one of Fulci’s lesser efforts. Inspector Gorley (Warbeck) and Jill Trevers an American photographer investigate a series of deaths in a small English village, which are seen as accidental deaths, but as the investigation continues a black cat is often lurking around during the deaths and suspicion soon falls on Robert Miles (Magee) who has the ability to communicate with the dead. The screenplay written by Biagio Proietti & Lucio Fulci is based off the Edgar Allan Poe story, but like many other films that were based off the Black Cat have very little to do with the Poe story and one has to wonder why this film and others even bothered unless it was simply for marketing. The script by Proietti & Fulci is rather boring with a weak plot and bland characters and even the dubbing was quite bland, which makes the characters even more lifeless. I suppose the idea itself wasn’t so bad, but the execution was way off and in the end the script ends up a total bore. As director Lucio Fulci fails at brining much to the film as the Black Cat is poorly paced and lacks any energy. Apparently, Fulci only did this film as a favor and I wouldn’t be shocked if it were true since this was kind of a lazy effort. While some of the problems can be placed on the script, but even in the scenes meant to entice suspense, Fulci pretty much fails at every turn. There is also some unintentional comedy and simply put the film is just s mess. Honestly this really doesn’t even feel like a Fulci film outside of the visual side of the film and the close up of the eyes grows tiresome and are mostly used at the wrong times. In some ways this film started the decline in Fulci’s career as after this things would only seem to get worse. I loved the New York Ripper, which came out the following year, but outside of that the bulk of his work was rather subpar with Murder Rock and Zombi 3 being tolerable and Cat in the Brain being the only worthwhile film he made post New York Ripper. As I stated this film features very little gore and the film carries an R-rating and the gore would be the standard R-rated picture of its time. The Black Cat would have been better suited if Fulci went the splatter route, but even than it might make the film more tolerable, but when all is said and done this would still be one of Fulci’s weaker films. Another problem with the film was the score by Pino Donaggio, which while not bad doesn’t really fit with the film. Donaggio is a good composer, but some of his scores can be either poor or don’t really fit the film and this was one of those scores. Despite having a solid cast including Fulci regulars Al Cliver, Daniela Doria as well as David Warbeck of the Beyond and Dagmar Lassander of House by the Cemetery and the cinematographer being Sergio Salvati who worked on several Fulci films including Zombi 2, City of the Living Dead and the Beyond just to name a few, the Black Cat is a rather poor film that’s often boring and lifeless. The film isn’t a complete waste as it does have some decent moments, but my advice is to skip this and go right to the New York Ripper instead.